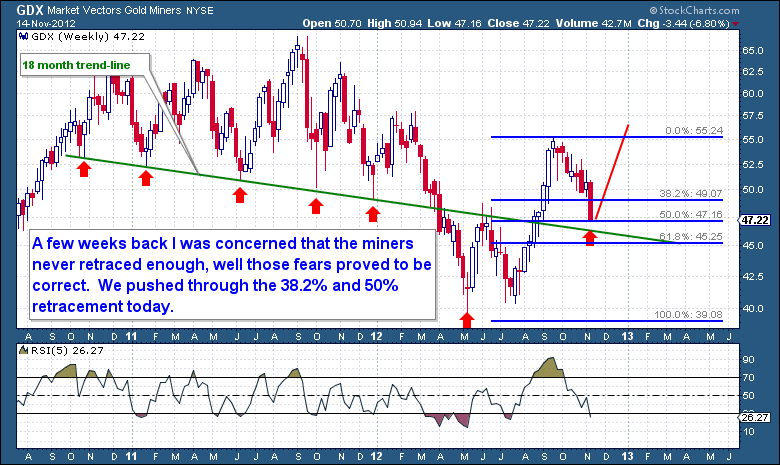 I know many people are concerned about Gold here as a result of the action out of the miners today. Before I look at the miners, I want to say that in light of the carnage within Equities and the PM Miners, Gold/Silver held up extremely well. I really believe that Gold is setting up for a very bullish upside move here. 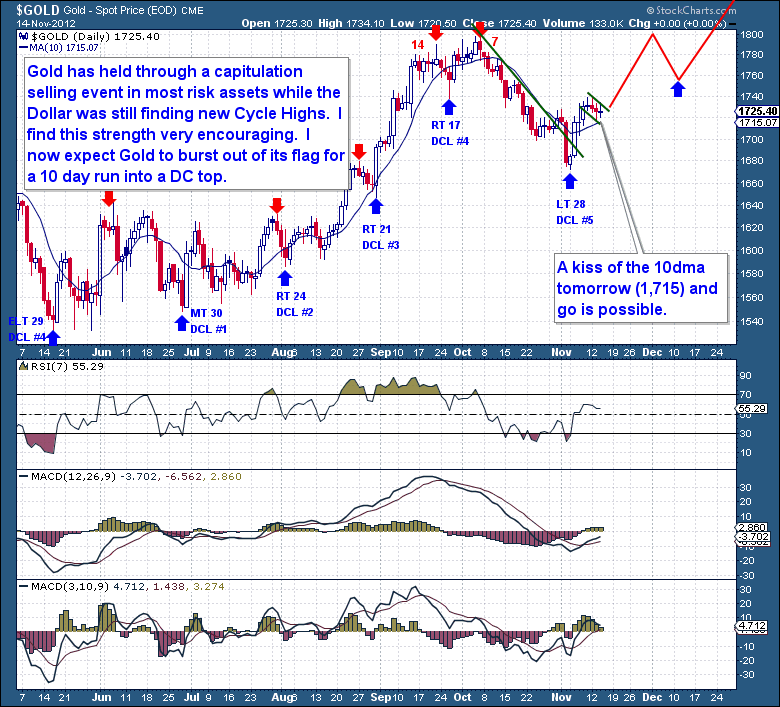 I do not see anything out of the ordinary from the Gold Cycle, actually quite the opposite in fact. If Gold still had a major drop ahead of it, then being on Day 8 and $70 above its last Cycle Low, it would have collapsed these past 3 days along with all risk assets. Absolutely no way that Gold holds up this well in a final Cycle when Equities are showing wash-out 90% down days and the miners are down 4%. What I see developing here on the Gold daily chart is a mini bull flag caused by heavy speculative retail selling being soaked up by smart money adding to their positions. The Cycle is still very young (Day 8) and Gold is just $9 off its Cycle high’s, there is absolutely no reason for concern from this Cycle, at this point. As long as gold holds its 10 day moving average ($1,715) then the Cycle is still firmly in uptrend and in a bullish state. I wish I could be as positive on the miners, but they have surprised me here. Hindsight is a perfect tool, but the real explanation here is that I simply put too much weight on the Gold to PM miner’s correlation and the notion that past PM Miners strength would equate to them leading us out of this Gold Cycle. These two assumptions were wrong and we now have a situation where the miners are finding their own ICL with the Equity Cycle, an entire half Cycle behind the Gold Cycle. But I have expressed my concerns with the miner’s charts before; they never did show the type of retracement and selling pressure that one would equate with an ICL. The decline had been short of 38.2% and the technical indicators were nowhere near oversold levels. Very simply I made the assumption that the amazing strength (8 Week rally) from the miners was the justification to support a mild decline. The miners are a tricky sector to play and I have said many times before that I much prefer to play the metals because I have a much better read on the Cycle. It’s also the main reason why 70% of the capital is invested in the metals versus 25% in the miners. When we look at the miner’s daily chart, we now have a picture that fits the profile for both a Daily and Weekly Cycle Low. The candle on today’s chart is extremely telling; the sheer drop adequately depicts a day of massive selling and general panic amongst holders of miners. Within just one session GDX managed to break below a channel trend-line, smash the 38.2% IC retracement, touch the 50% Fibonacci retracement, and fall right through the lower Bollinger Band. 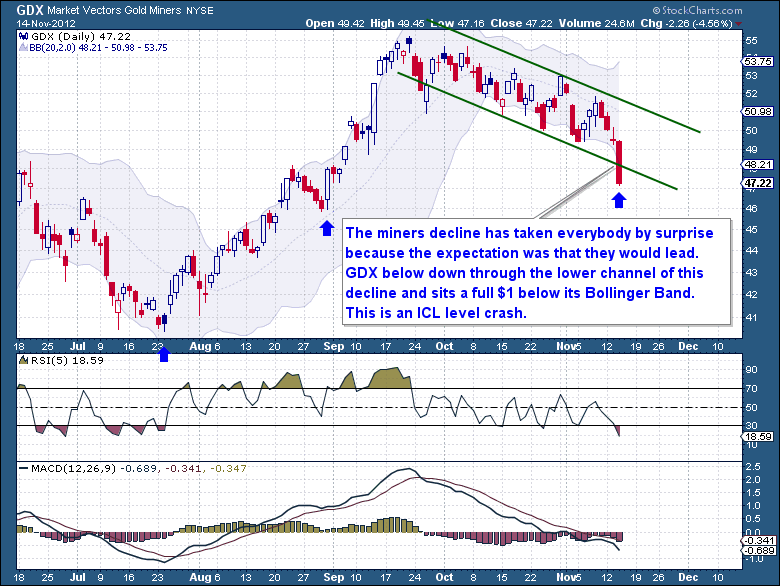 The Bollinger Band crash was so extreme that GDX sits a full $1 below the band. The weekly (Investor Cycle) chart is pretty much a similar picture to the Daily. It was this particular chart that had me worried the most lately as the RSI(5) was nowhere near oversold and the retracement was extremely mild. Today’s action perfectly retraced (to the cent) back to the 50% level and where it closed near the lows of the day. At this point I don’t know if the miners are done. Typically after such an extreme selling event you will see a significant bounce the following day, but there is just no guarantee. What I would like to see (same for Equities) is for another panic and gap down open tomorrow morning that is reversed by mid-day. Another drop tomorrow morning would likely be met with an exhaustion of sellers and the makings of a significant ICL buying squeeze. This is an excerpt from the mid-week update from the The Financial Tap, which is dedicated to helping people learn to grow into successful investors by providing cycle research on multiple markets delivered twice weekly, as well as real time trade alerts to profit from market inefficiencies. They offer a FREE 15-day trial where you’ll receive complete access to the entire site. Coupon code (ZEN) saves you 15%. I hope you abide to a tight stop loss because I see the USD going higher and the FXE lower. Which means GOLD and SILVER will see much lower prices.